With the release of the 9-minute prologue in front of The Hobbit this weekend a brand new trailer for Star Trek Into Darkness has surfaced and supplies a first look at more of the Enterprise crew in this sequel to the mega-successful 2009 film. Back at the helm is J.J. Abrams and the villain for which he has enlisted this go around has been under much speculation as of late. Well known British actor Benedict Cumberbatch is portraying the baddie who as of now is being called John Harrison though this name apparently has no meaning in the Star Trek universe. I am not a devoted fan of the series and never watched a single episode of the original or its many incarnations. My first exposure to these characters and to this world was in fact Abrams 2009 film and so, despite my history with the world, I am very excited to see the only version I know of this continue. The new trailer carries a more somber tone and features a voice over from Pike (Bruce Greenwood) that seems to be a speech he is giving to Kirk (Chris Pine). From here the trailer unleashes quick cuts of the multitude of action this film will no doubt contain. Is Cumberbatch playing Khan? Have you seen the prologue? What did you think? Be sure to let us know in the comments below. 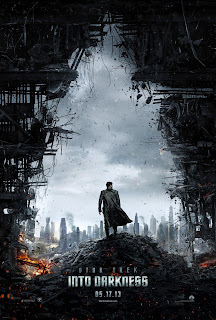 The film also stars Zachary Quinto, Karl Urban, Anton Yelchin, Zoe Saldana, John Cho, Simon Pegg, Alice Eve, Peter Weller, and Noel Clarke and opens in 3D and IMAX 3D on May 17, 2013. Synopsis: When the crew of the Enterprise is called back home, they find an unstoppable force of terror from within their own organization has detonated the fleet and everything it stands for, leaving our world in a state of crisis.With a personal score to settle, Captain Kirk leads a manhunt to a war-zone world to capture a one man weapon of mass destruction.As our heroes are propelled into an epic chess game of life and death, love will be challenged, friendships will be torn apart, and sacrifices must be made for the only family Kirk has left: his crew.